There is a considerable overlap in the coverage of London and in particular Middlesex on this server. And even this description doesn't give the full story, as parts of Middlesex went to Surrey and Hertfordshire. However, following the practice adopted in the LDS Family History Library, parish-level information will be provided here only for parishes belonging to the City of London, leaving parishes from elsewhere in the Greater London area to the Middlesex, Kent, Surrey and Hertfordshire pages as appropriate. London Metropolitan Archives (formerly Greater London Record Office), 40 Northampton Road, London EC1R 0HB - holds the archives of the Greater London Council, the London and Middlesex County Councils and their predecessors. Note it is usually closed first two weeks of November for stocktaking. Leaflet: Family History at London Metropolitan Archives. City of Westminster Archives Centre. Library and Museum of Freemasonry Freemasons' Hall, Great Queen Street, London WC2B 5AZ. For a summary see their entry in 24 hour museum. The Mormon's Hyde Park Family History Centre has an online catalogue of its holdings. The Wellcome Library of the history of medicine holds not only high-level material on medical history but also a huge amount of information on named individuals. They have a guide to Biographical and Family History Resources in the library. London Boroughs - Archives and Local Studies Libraries: we have links to web sites of each London borough, and to their archives or local studies libraries. AIM25 - Archives in London and the M25 Area - "is a major project to provide electronic access to collection level descriptions of the archives of over fifty higher education institutions and learned societies within the greater London area." Outside London, the Institute of Genealogical and Heraldic Studies, in Canterbury, Kent, provides an online list of their library resources relating to London and Middlesex (pdf). For a general bibliography see London's Past online, a bibliography produced by the Centre for Metropolitan History in association with the Royal Historical Society Bibliography. We give below some specific genealogy books about London. Books in print are grouped by publisher in this list, with links to their websites. GENfair, the Federation of Family History Societies "One-Stop Shop" for Family and Local Historians. "London & Middlesex: a genealogical bibliography", by Stuart Raymond, vol.1: Genealogical Sources, vol.2. Family Histories & Pedigrees, (2nd edn 1997) also "Londoners' Occupations: A Genealogical Guide" (2nd edn 2001), published jointly with Stuart Raymond. "Lists of Londoners", by J.S.W. Gibson and H. Creaton, 2nd edn 1997. "17th Century London Inhabitants", by T.C. Dale, London, Guildhall Library. "A Guide to the Genealogical Sources in the Guildhall Library", by R. Harvey, Guildhall Library 1988. "The 1695 Inhabitants of the City", by M.P.E. Jones, London, Guildhall Library. The best list of cemeteries where ancestors may have been buried within the area of the County of London seems to be I M Holmes Return of burial grounds in the County of London 1895, which lists all burial grounds then existing in the County. Copies of the book are held at the Guildhall Library and LMA. A scanned copy of a Catalogue of of the tombs in the churches of the City of London AD 1666 is in the Internet Archive. London burials from David Orme attempts to have details, photos, documents about every burial ground in the old Greater London area. Victorian London Cemeteries from Gendocs (archived copy). Background information on Victorian Cemeteries from Tracy Chevalier's website about her novel "Falling Angels"
The Church Monuments Society has a page devoted to churches in Greater London with interesting collections of monuments. The Historic UK website has a map and description of the reputed plague pits of London during the great plague of 1665. The Western Charitable Foundation is an independent Jewish Orthodox burial society has a graves database covering its cemeteries at Edmonton, Cheshunt, Streatham and Fulham, whcih is searchable by surname, and gives full name, cemetery, plot number and date of burial. Abney Park (1840) Abney Park Cemetery Trust, with the Abney Park Cemetery Index 2005. Brompton (1840) Friends of Brompton Cemetery (details in list of organisations from Royal Borough of Kensington and Chelsea). Burial records are indexed on DeceasedOnline. Highgate Cemetery (1839) Friends of Highgate Cemetery Limited have details of visits, and searches in lists of persons buried. Burial records are indexed on DeceasedOnline. Kensal Green, (1832) Friends of Kensal Green Cemetery. Records are indexed on Deceased Online. Nunhead (1840) Friends of Nunhead Cemetery. Burial records are indexed on DeceasedOnline. West Norwood (1837) Friends of West Norwood Cemetery, also see Lambeth burials and cremations records. Burial records are indexed on DeceasedOnline. The Brookwood Cemetery was opened in November 1854, and was the largest in the world. It was originally called the London Necropolis or Woking Cemetery. Although it lies outside the London area, it was the place of burial for thousands of Londoners. The cemetery is still privately owned and trades as Brookwood Cemetery Limited. The records are kept at the cemetery and there is a charge for them to be searched, but microfilm copies are held at the Hyde Park Family History Centre and the Surrey History Centre, where the Friends of Surrey Cemeteries have been indexing them. In addition The Brookwood Cemetery Society is a voluntary organisation devoted to the cemetery. City of London Cemetery & Crematorium opened 1856. The City of London is placing high quality images of the burial registers online (as of September 2008, this covered 1856-1865). Judith Gibbons and Ian Constable have prepared an index to them. After searching on the latter site you will also see a decription of some errors in the dates on the City of London site. Ladywell Cemetery (serving Lewisham) and Brockwell Cemetery (serving Deptford) were adjacent to one another in the parish of Lewisham. North West Kent FHS have provided an online index to 13,700 of the gravestones. There is also a Friends of Brockley and Ladywell Cemeteries group. 1861 census from findmypast.co.uk. Search, index details and digitised images are on a pay-per-view basis. London, Essex, Kent, Middlesex, and Surrey are available. 1871 census from British Origins is an index with digitised images. Available by subscription, from 72 hours to annual. 1881 U.K. census index online in FamilySearch This covers the whole country. From the home page choose "search", it is one of the databases available. Online search and details are free. It is also available on CDROM. From FamilySearch home page choose Order/Download products, search for "British Census" or "1881". The index is available in Family History Centres of the Church of Jesus Christ of Latter-Day Saints, from all their distribution centres, and in many other libraries. 1901 Census Online is available from the Public Record Office, providing a name index and digital images of enumeration book pages. This covers the whole country. Search is free, details are pay-per-view. S&N British Data Archive CDs for London have published on CD as facsimile of enumerators' books the census for London 1851, 1861 (with partial name index for 269,000 entries at October 2003), 1871 (with partial name index, 62,000 entries), 1891 (with partial name index, 1.3 million names at June 2003) and 1901. PRO street indexes are included. S & N also have a census name indexing project - in progress. This is a scheme where users do indexing of at least half a PRO piece and will receive an index of other pieces in return (there are 1200 members of this scheme). The name indexes are sold with the CDs of the images (1891 available as a separate item). Facsimile of the 1841 census is being prepared. The indexes are also searchable online, on a subscription basis. 1891 and 1901 census index from Ancestry - complete for England and Wales. Surname search is free, details available on a paid subscription. Southwark Local History Library - has unpublished indexes, but web page has no list, see London Census Surname Indexes (archived copy) from Gendocs for list. You can also perform a more selective search for churches in the City of London area or see them printed on a map. City of London Anglican churches from Gendocs (archived copy). Current churches from FindAChurch in the City of London. Churches of London from Steve James (now only availble in the Internet Archive) has a map of the City of London showing churches, and a list showing dates previous churches were demolished, or where there is a tower only. The map also shows the city wall, and the extent of the great fire of London.There are photos of many of the churches. The COLLAGE database (Corporation of London Libraries and Guildhall Art Gallery image database) has very many images related to the churches of the City of London the wider London area. Simply search on the church name or the place-name plus 'church' to find relevant images. The Friends of the City Churches has pictures and details of opening times and services for all surviving churches in the City of London. A list of Victorian London Churches for all the main denominations from Gendocs (archived copy). The Registers of the Bishops of London, 1304-1660 are available on microfilm from Thomson Gale, and include ordination registers which are useful for tracing clergy ancestors. Registration Districts in London for the period 1837-1974. Over the years London has had many prisons and similar institutions. There were Compters to hold debtors both within the City and outside it, in Southwark and Middlesex. At various times there were prisons at Ludgate, Newgate, the Fleet, Temple Bar, and Bridewell, and there were medieval prisons at St Martin Le Grand, and Tun upon Cornhill. A list of inmates, victims and those associated with Newgate Prison, from the book The Chronicles of Newgate by Arthur Griffiths, published 1896. Newgate Calendars - formerly provided by the University of Texas in their Law in Popular Culture Collection E-texts, but now only on the Wayback Machine. A reproduction of the Newgate calendars, from the mid sixteenth century to the nineteenth there is plenty of gory details about murderers, forgers and many other wrongdoers. Each entry has a potted biography of the guilty and a detail of their crime. The Rossbret UK Institutions website has some information on Prisons in London (now only available on the Internet Archive). The Proceedings of the Old Bailey London 1674 to 1834 from the Universities of Sheffield and Hertfordshire, a fully searchable online edition of accounts of over 100,000 criminal trials held at London's central criminal court. Includes links to maps, and the manuscript sessions papers (which include witness and defendant statements made before the trial took place) and the Ordinary's Accounts (biographies of convicted felons compiled just before they were executed). The Consistory Court of London was a church court with jurisdiction over much of London and Middlesex as well as parts of Essex and Hertfordshire. It heard cases involving matrimonial matters (including divorce and separation), breach of promise, probate disputes and defamation. The Society of Genealogists has published an index for the years 1700-1713, and an online version is available on British Origins with a useful explanation of the structure of the records. London Labour and the London Poor by Henry Mayhew, in four volumes: Volume 1, Volume 2, and Volume 3 were published in 1851, and an supplmentary volume in 1861. Charles Booth's survey into life and labour in London (1886-1903). A guide to the alleys, courts, passages and yards of central London, by Ivor Hoole. Archive CD Books publish facsimile on CD of many trade directories. There are detailed descriptions of contents on their website. They include some sources for 17th and 18th Centuries; Post Office 1819, 1843, 1848, 1851, 1856, 1902, 1934, 1938; Post Office 1902 "London Northern Suburbs" and "London Southern Suburbs" with more people listed than the overall London directories; Pigots 1822 and 1825; Royal Blue Book 1833, 1860; Boyles Court Guide 1847; London Diocese Book 1890; Kelly's for Chiswick 1938, Kensington 1939, Acton 1939, Hammersmith 1939/40. Society of Genealogists has a good collection and publishes a list "Directories and poll books in the library of the Society of Genealogists" compiled by N J N Newington-Irving, 6th edn 1995. London Merchants of 1677. She says "The publication in 1677 of 'A collection of the names of the merchants living in and around London' for Sam. Lee and Dan. Major was possibly the first printed commercial directory of London." - the list is from this and other sources. Kent's Directory 1740 containing an alphabetical list of the names and places of abode of the directors of companies, persons in public business, merchants, and other eminent traders in the cities of London and Westminster, and the borough of Southwark. Victorian London A-Z Street Index from Gendocs (archived copy). The Lost London Street Index - an index of over 3500 streets that have undergone a name change or have disappeared altogether over the last 200 years (via Internet Archive). A Guide to the Alleys, Courts, Passages and Yards of Central London by Ivor Hoole; gives location and history of over 400 byways (via Internet Archive). List of the Streets and Places within the Administrative County of London 1929 CD from Archive CD Books, shows alterations since 1856. 1841 Census London Street Index CD The 1841 Street Index for Metropolitan London, Middlesex/Surrey, was originally published by Austalian Institute for Genealogical Studies as microfiche in 1996 and has been converted to CD. The Rayment Society have lists of London streets with changed names, arranged by both old and new names. The National Archives have a useful podcast by Dave Annal entitled Lost in London which is a guide to genealogical research in London before 1837. This is a recording a of a talk given on 14 June 2012. GENDOCS lists for London (archived copy) cover census, churches, cemeteries, inns, probate, streets, lodging houses, institutions ... and much more. London Ancestor is a site with a variety of sections, including research interests, reciprocal research, illustrations of churches and other buildings, newspaper extracts, etc. Curious Fox describes itself as the "village by village contact site for anybody researching family history, genealogy and local history in the UK and Ireland." They have a London listing. One-Place Studies: "One-place studies are a branch of family history and/or local history with a focus on the entire population of a single road, village or community, not just a single, geographically dispersed family line" (Wikipedia). There are listings covering the City of London on the Society for One-Place Studies website and the Register of One-Place Studies. Hazel Dakers website has a series of articles demonstrating by example how to go beyond the basics of genealogy. There is a bias towards London, South African and Jewish examples but the site is by no means only about Jewish genealogy, and she provides good examples of migration, within the British Isles and beyond. GenealogyWise is a social networking site for Genealogists, and has both a London group covering Greater London, and a LONDON: Livery Companies, etc. group covering citizens of the City of London. Ideal Homes: Suburbia in Focus is a history of suburbs in South East London's six boroughs; Bexley, Bromley, Greenwich, Lambeth, Lewisham and Southwark, including personal accounts of life in words and pictures. It is a joint venture between all six boroughs and the University of Greenwich. It contains thousands of old and contemporary photographs and descriptions of life in South East London. British History Online catalogue for Greater London sources: Text of many documents including directories, Victoria County History volumes and drafts, maps, a tax list, gazetteers,list of City of London inhabitants 1695, others. See also their guide to urban history on BHO. London Archaeologist covers every significant archaeological discovery, period, event and issue. As well as archaeological reports it includes historical articles and book reviews. The online archive at the Archaeology Data Service includes all articles, along with selected indexes, from 1968-2005 (volumes 1-10). More recent volumes can be obtained from the London Archaeologist website. The Second Great Fire of London - 29th December 1940 - from A London Inheritance website. CityHire have an interesting timeline of the last 200 years. Books: there are thousands of books about London history, here are a few. J Bullman, N Hegarty, and B Hill, The Secret History of our Streets: London, a social history through the houses and streets we live in, BBC Books, 2012. This book accompanies the BBC series of the same name looking at how London has changed since Charles Booth's survey recording social conditions in 1886, returning to six archetypal London streets. W.R. Dalzell, The Shell Guide to the History of London, Michael Joseph, 1981. W. Kent, An Encyclopedia of London, J.M. Dent & Sons, 1970. Roy Porter, London. A Social History, Hamish Hamilton, 1994. Your Old Books and Maps CDROMs include "Medieval London and Old St. Pauls cathedral" and are preparing 1909 and 1920 guides to London. The International Association of Jewish Genealogical Societies Cemetery Project includes a listing of Jewish cemeteries in and around London, and general information to aid the location of a burial. See above for the Western Charitable Foundation's Orthodox Jewish cemeteries. The Knowles Collection from FamilySearch includes thousands of London Jews in a database building on the work of the late Isobel Mordy. Sun Fire Office policy registers 1816-1833 are held at Guildhall Library and searchable on the National Archives' Discovery Catalogue - choose Guildhall Library as location (at the bottom of the Advanced Search form). You can search by names of people, institutions, streets, place names and occupations. The index covers the registers of the Sun's London office, which cover mainly London properties. For this reason, street names only are given for most of the entries and London can be assumed where no county is given. A few country properties are also included. The Collage Portal (Corporation of London Libraries and Guildhall Art Gallery image database) has historic maps of London. On "Advanced search" choose picture type as "map", enter place name of interest as search term. The website has thumbnail and part-screen images of the maps, and a facility to order a detailed image. Your Old Books and Maps sell on CD Black's 1920 Guide to London and its environs, illustrated with many maps and plans. They have other CDs for the area including "London 1909" with bird's eye views. MAPCO (archive maps) or (Map and Plan Collection Online) is a free map website by David Hale displaying high quality London and other maps and views. There are maps and panoramas dating from 1560 to 1897. Stanford's Geological Library Map Of London And Its Suburbs 1878 at 6 inches to the mile is detailed and useful. The MOTCO website "contains a reference database of topographical prints, maps, prospects and panoramas of London, the Thames and the UK. It also provides the opportunity to purchase CDs of the London maps and high quality reproductions...". The maps range in date from 1705 to 1862. The Baedeker's Old Guide Books site has maps from Baedeker's London and its Environs 1905. The East London History Society offers Old Maps of Tower Hamlets, ranging from 1745 to 2000. Genmaps provide a wide range of London maps of different dates and with scans of varying quality. Peter Higginbotham's Workhouse website has maps of Poor Law Unions in London (circa 1900) and Poor Law School Districts in London. Locating London's Past website allows searches of a range of data relating to seventeenth and eighteenth-century London, and to map the results on either John Rocque's 1746 map, or the 1869-80 First Edition Ordnance Survey map. 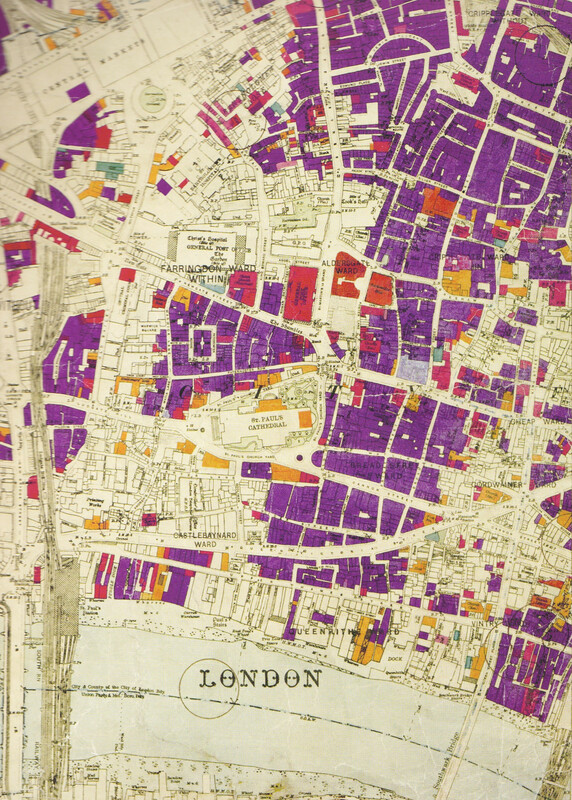 The datasets include the 1666 hearth tax, Mortality and Plague in 1665, London Lives 1690-1800, Records of clay tobacco pipes and glass tableware from London archaeological sites, Proceedings of the Old Bailey and parish population estimates from the Bills of Mortality, Marriage Duty Assessments, and the 1801 census. London Bomb Damage - from the A London Inheritance website..
Records of over 100,000 patients admitted between 1852 and 1914 to Great Ormond Street Hospital for Sick Children, its convalescent home at Cromwell House, the Evelina Hospital (now part of Guy's and St Thomas's) and the specialist Alexandra Hospital for Children with Hip Disease are available online at the Historic Hospital Admission Registers Project (HHARP) website. The precise periods differ between the institutions. Boyd's Inhabitants of London gives the names and brief biographical and family details of 60,000 men who lived in the City of London at dates ranging from 1209 to 1948. The original is available at the Society of Genealogists, and an online version is available on Findmypast with a useful explanation of the structure of the records. Much of the information has also been transcribed into a lineage-linked database on FamilySearch. Richard Heaton has compiled a list of digitised London newspapers. Thousands of children were apprenticed to masters in London. Cliff Webb has compiled indexes to the records for the Society of Genealogists, and an online version is available on British Origins with a useful explanation of the records. Ancestry have an index to about 1000 Child Apprentices in America from Christ's Hospital, London, 1617-1778, drawn from Coldham, PW (1990) Child Apprentices in America from Christ's Hospital, London, 1617-1778. Baltimore, MD, USA: Genealogical Publishing Co., which itself was based on the manuscript records in the Guildhall Library. The Records of London's Livery Companies Online website provides "records of Apprentices and Freemen in the City of London Livery Companies between 1400 and 1900". As of June 2012 if covered the Clothworkers (1545-1908) and the Drapers (c.1400-1900) with Goldsmiths (1600-1700). In future it will have complete coverage of Goldsmiths and of Mercers. Ancestry have indexed and placed on line images of the Admission Papers for Freemen of the City of London, 1681-1925. These are from the records of the City itself, but include reference to the livery company of the admitted person. They cover all types of admission, but there are some gaps (mostly in the 1680s and 1770s-1780s). Full information is given in a leaflet from LMA. Pub History gives many details about an enormous number of pubs in the South East of England. The Metropolitan Police have a page on their Historical Records. The London Vintage Taxi Association: information about cabs and their drivers, even some jokes. photoLondon offers a database of 19th century photographers and allied trades in London, 1841-1901. Barnardo's (extract from their History page): In 1867, Thomas Barnardo set up a ragged school in the East End, where poor children could get a basic education. .. In 1870, Barnardo opened his first home for boys in Stepney Causeway. .. Barnardo later opened the Girls' Village Home in Barkingside, a collection of cottages around a green, which housed 1,500 girls. By the time a child left Barnardo's they were able to make their own way in the world - the girls were equipped with domestic skills and the boys learnt a craft or trade. The Coram Family (formerly the Thomas Coram Foundation for Children) has been working continuously with deprived and disadvantaged children since 1739 when Thomas Coram established The Foundling Hospital to provide care for the homeless children he found living and dying on the streets of London. Through support from artists and others, he made a remarkable collection of treasures, now housed in The Foundling Museum at No 40 Brunswick Square, on the site of the original Hospital. From its foundation in 1741 the Foundling Hospital rescued abaondoned babies, but from the 1760s it extended its remit to accommodate the children of unmarried mothers who made written petition for the child to be accepted. The surviving applications record details of the lives of the mothers, which can include how they became pregnant and of their employment. About two-thirds of applications in the 19th century were from women in domestic service. The type of information available is detailed in an article by Pamela Horn in Genealogists' Magazine vol. 29, no. 8, pp.293-297 (December 2008). Metropolitan and City Police Orphanage: records relating to children who were in the Orphanage are at the Metropolitan and City Police Orphans Fund, 30 Hazlewell Road, Putney, London, SW15 6LH. "Beer and Bullets - yes it's the police orphanage" is an article in the March 2002 issue of Metline, the magazine of the Metropolitan Police Federation. The Rossbret UK Institutions website has some information on London Orphanages (now only available on the Internet Archive). The City of London is governed by the Corporation of London which is run by the Lord Mayor and 132 members elected from 25 voting districts or "wards". Each ward elects an alderman and between 4 and 12 members depending on its size. From 1550 to 1899 there was a 26th ward of Bridge Without, as the Borough of Southwark was partly under the jurisdiction of the City of London, but this ward only had an appointed alderman and no common councilmen. It was merged with the ancient ward of Bridge, alias Bridge Within, to form the current ward. Peter Higginbotham's Workhouse website has lots of information about workhouses and specifically about the City of London workhouse as well as the Metropolitan Asylums Board and lots of other London workhouses. The Rossbret UK Institutions website has some information on a variety of Poor Law insitutions in London (now only available on the Internet Archive). The Origins Network are making available abstracts of poor law settlement examinations for the City of London transcribed by Cliff Webb. These have been released as London Poor Law Abstracts 1581-1899, which has 22,440 abstracts from 58 of the parishes of the City of London. This subsumes the older index Poor Law Abstracts 1742-1868, which covered only the parishes of St Botolph Aldgate 1742-1868 and St Sepulchre 1765-1844. The geographical locations of the pre-1968 London dialling codes and exchange names are listed on Roger Haworth's London Director Exchange Names page. PCC Wills 1384-1858 - on line from The National Archives . Index search is free, there is a charge to download a will as a digital facsimile image. Over a million wills are held. The University of London has placed online lists of all officials, teachers, graduates and undergraduates from its foundation in 1836 up until 31 March 1901, as published in 1890, 1899 and 1901, and a list of all University of London graduates up to December 1932. Coal Tax Posts as previously described on the Corporation of London website "were erected under the London Coal and Wine Duties Continuance Act, 1861, but some were originally set up under earlier nineteenth century Acts. The duties whose area of application they marked out originated in the seventeenth century and earlier.The Corporation of London had exercised the right of 'metage' (measuring) of coal and other commodities since mediaeval times and these rights were confirmed by two Charters of King James I. The City was later permitted to set up "a Boundary Stone, or some other permanent Mark" where any turnpike road, public highway, railway or canal entered the District. The surviving boundary marks define the London district after it was changed in 1861." The website gives details of the duties and posts, and gives a list of the remaining posts around London. Ekwall, E (1951) Two Early London Subsidy Rolls. Lund: CWK Gleerup. Covers the years 1292 and 1319 and is now available at British History Online. Unwin G (ed.) (1918) Finance and trade under Edward III - The London lay subsidy of 1332. Contains a discussion of various analyses of the lay subsidy roll, but very few names. Now available at British History Online. Lang RG (ed.) (1993) Two Tudor subsidy rolls for the city of London 1541 and 1582. London: London Record Society. Now available at British History Online. Alan H. Nelson is developing an online index to the names in the Lay Subsidy Returns for London and adjacent areas, covering London, Middlesex and north Surrey 1593-1600, London 1582 (including some material in Lang above), and London 1576. A 1638 list of tithe-payers has survived in Lambeth Palace Library and was published as Dale TC (ed.) (1931) The Inhabitants of London in 1638. London: Society of Genealogists. It is Now available at British History Online. London Inhabitants within the Walls, published as Glass DV (ed) (1966) London inhabitants within the walls, 1695. Leicester: London Record Society. Now available at British History Online. London Inhabitants without [i.e. outside] the Walls, for which a typescript index is available at LMA. Returns for 17 parishes do not survive, but an attempt has been made to fill the gaps using tax assessment of similar date, and an index published as "A Supplement to the London Inhabitants List of 1695 Compiled by Staff at Guildhall Library" in Guildhall Studies in London History Vol. 2, Nos. 2 (surnames A-M) and 3 (surnames N-Z and trades) (April and October 1976). Land Tax was levied 1692-1932. Ancestry have indexed the records held at LMA, covering the City of London, Middlesex (including most Westminster parishes), and some parishes in Kent and Surrey. A description is given in a copy of a leaflet from LMA, though this out of date in some respects. The Harleian Society volume 1: Howard, JJ, and Armytage, GJ (eds) (1869) The Visitation of London in the Year 1568 is available from Google books. The Harleian Society volumes 15 and 17: Howard, JJ, and Chester, JL (eds) (1880) The Visitation of London, 1633, 1634, and 1635 is available online: volume 15 (surnames A-H) , and volume 17 (surnames I-W). The Harleian Society volume 92: Whitmore JB and Hughes AW (eds) (1940) London Vistation Pedigrees 1664. is available on CD from Archive CD Books.